The Angular CLI is a command line interface for Angular developed by Angular Team. This tool helps us quickly get started with the creating the Angular Application. In this tutorial, we will learn how to create & Manage the Angular app using the Angular CLI commands. We will be covering the commands like ng new, ng generate component, ng generate directive & ng generate pipe etc. Once you make a choice, then you have set up a lot of libraries and packages. Each of these libraries comes with their own configuration files. For instance, you need to create Package.Json file and add all the required libraries. Create Webpack or SystemJS configuration files. Configuration files are also required for Typescript & Typings etc. You need to configure the Testing Framework also. Instead, you can install Angular CLI and get started right away. The Angular CLI creates the Angular Application and uses Typescript, Webpack ( for Module bundling), Karma ( for unit testing), Protractor ( for an end to end testing). The first step is to install the Angular CLI. This can be done by using the following command. The above command installs the latest version of Angular CLI in your machine. Note that we have used the -g flag, (which stands for global) installs the Angular CLI system-wide so that you can use it in your all projects. 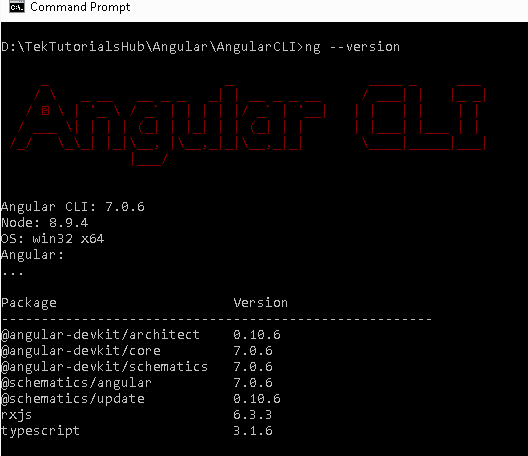 Since, the Angular Version 6, the Angular CLI follows the same Version No as the Angular. Hence for Angular 7, the corresponding version of the Angular CLI is 7. The latest version as of writing this article is 7.0.6. The command above also gives the version of node installed in your system. help Help message shows the List of available commands and their short descriptions. add Adds the npm package to the workspace and configure the default app project to use that library. generate g Generates and/or modifies files based on a schematic. serve s Builds and serves your app, rebuilding on file changes. test t Runs unit tests in a project. e2e e Builds and serves an Angular app, then runs end-to-end tests using Protractor. doc d Opens the official Angular documentation (angular.io) in a browser, and searches for a given keyword. lint l Runs linting tools on Angular app code in a given project folder. The ng new command is used to create new folder and creates an App with the provided name. What name would you like to use for the project? Would you like to add Angular Routing? Answer this as Yes unless you do not want to add Angular Routing. Which stylesheet format would you like to use? --dry-run -d Run through without making any changes. --collection -c Schematics to use. For more info on Schematics click here. --inline-template -t Does not create an external template file for the component. Specifies if the template will be in the ts file. ng generate or (ng g) is used to generate component, module, class, pipes & directives etc. The following tables shows the list of artifacts that can be generated. --dryRun=true|false -d false When true, run through and report activity without writing out results. true|false|json|JSON false Shows a help message for this command in the console. --interactive=true|false false When false, disables interactive input prompts. The following command generates the component. Run these commands from the root folder of the application. ng g component --flat Hello does not create the hello folder. The component is created in the src/app folder. ng g component --export hello adds the component to the exports metadata array of the module. ng g component --prefix=myapp hello uses the CSS selector as myapp-hello. --changeDetection= Default|OnPush -c Default Specifies the change detection strategy. --entryComponent= true|false false Specifies if the component is an entry component of declaring module. --export=true|false false Specifies if declaring module exports the component. --flat= true|false false Flag to indicate if a directory is created. --inlineStyle= true|false -s false Specifies if the style will be in the ts file. --inlineTemplate=true|false -t false Specifies if the template will be in the ts file. --lintFix= true|false false Specifies whether to apply lint fixes after generating the component. --module= module -m root module Allows specification of the declaring module. --prefix= prefix -p The prefix to apply to generated selectors. --project= project The name of the project. --selector= selector The selector to use for the component. --skipImport= true|false false Flag to skip the module import. --spec= true|false true Specifies if a spec file is generated. Emulated| Native| None| ShadowDom -v Emulated Specifies the view encapsulation strategy. The above command does not create the folder. You can use the ng g directive directive/Some, which will create the directive under the folder directive. Use the--module flag to add the directive to a module other than the root module. Use the --prefix or --selector flag to change the CSS Selctor. --flat= true|false true Flag to indicate if a directory is created. The above command does not create the folder. You can use the ng g pipe pipes/Date, which will create the pipe under the folderpipes. Use the--module flag to add the pipe to a module other than the root module. --export=true|false true Specifies if declaring module exports the component. The above command does not create the folder. You can use the ng g service services/Data, which will create the service under the folderservices. Use the command ng g class class/customer to create the class under the class folder. You can add component, directive, pipe & services to module by using the flag --module=[ModuleName] and naming the component as [ModuleName]/[ComponentnNme]. --module=module -m Allows specification of the declaring module. --routing=true|false false Generates a routing module. --routingScope=Child|Root child The scope for the generated routing. The Angular CLI helps to increase productivity by helping us to quickly create the app and add the component, pipes, services & directives etc to the module. The Angular CLI has lot more commands like serve, build, test, lint, e2e etc, which help us to build and distribute the applications. We will cover those in one of the future tutorial.